Snow and ice removal on roads, sidewalks, parking lots and driveways can make getting around Minnesota a lot easier during winter. Improperly maintained, icy surfaces can cause debilitating falls and car accidents, and even create liability issues. But before you pull out your deicing salts to make conditions safer, consider the impact of these chemicals on our plants and our waterways. While regular snow removal reduces the potential for slippery conditions, sometimes ice can build-up and create hazards. Deicing salts are applied onto icy surfaces and reduce the melting point of water to anywhere from 20°F to - 30°F depending on the formulation. This prevents ice from forming. According to the Minnesota Pollution Control Agency, sodium chloride is the most commonly used product for deicing roads, sidewalks, parking lots, and driveways. Other deicing chemicals include magnesium chloride and calcium chloride, calcium magnesium acetate and urea. Organic additives like corn molasses, beet juice and even cheese brine have been added to some of these chemicals to improve performance and inhibit corrosion. While deicers clearly improve safety and getting around in the winter, it’s important to maintain hard surfaces properly and use deicers only on critical areas. One teaspoon of salt will pollute 5 gallons of water. Research demonstrates that runoff from deicing chemicals results in pollution of our groundwater, the source of most Minnesotans’ drinking water. Chloride in high amounts affect the oxygen levels and natural mixing of lakes and waterways, and is toxic to fish, aquatic bugs and amphibians. Excessive use of deicing salts can also degrade concrete, asphalt and natural stone, and corrode metals. Deicing salt harm and ultimately may kill plants. Sodium chloride, the most commonly used deicer in the Twin Cities, causes the most significant plant damage. Salt can be absorbed by plant roots, causing dehydration, and salt spray can burn turf and foliage especially on evergreens. Sodium causes clay particles in soil to expand, increasing soil compaction, reducing water infiltration and making it hard for roots to grow. Weeds like Canada thistle, however, grow well in compacted soils. Watch this video. Produced by the Mississippi Watershed Management Organization, it offers tools for environmentally friendly snow and ice removal. Shovel, scrape and sweep snow often to remove as much snow to prevent ice buildup. Avoid depositing snow onto nearby shrubs as it may contain salts and / or break branches. If it’s a warm day, let any remaining snow layer on surfaces just melt. If needed, apply deicing salts correctly and sparingly to critical areas only. Read the product label and apply the product as directed including at the proper temperature. Do not apply deicers to snow. Remove the snow first. More is NOT better! A coffee mug of salt (about 12 oz.) is all that is needed for about 1,000 sq. ft., approximately the area of a 20-ft driveway or 10 sidewalk squares. Spread salt evenly leaving about 3 inches between salt grains. Avoid spilling piles of salt. 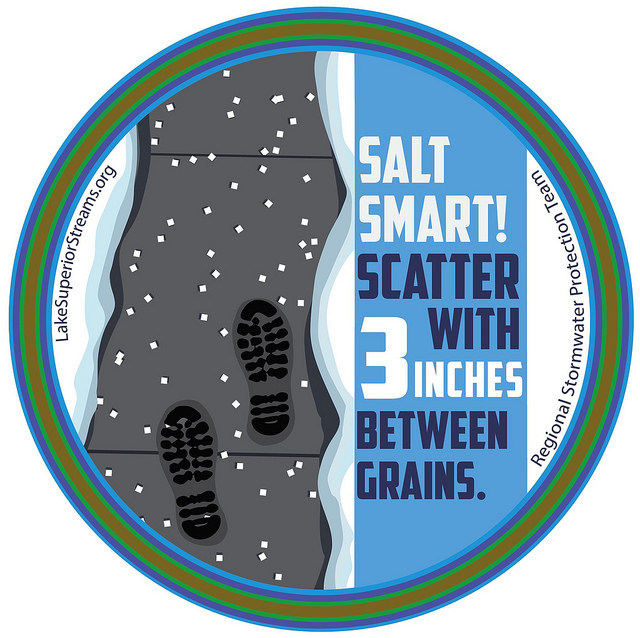 Sweep up any salt grains you see on dry surfaces to prevent it from washing or blowing into plantings and waterways. Save it in a container to reapply later in the season. Choose salt-tolerant plants that die back each year for areas along sidewalks, driveways and streets where deicing salts may be used. Choose lawn seed mixes and sod containing salt-tolerant fine fescues. Perennial flowers die back over winter making them good choices along driveways, walks and streets. Replaced each year, annual flowers are also good options. Do not plant evergreens along surfaces where deicing salts are used and can kill needles. This is why it's important to plant trees and shrubs at least 3 feet from driveways and walks where deicing salts are applied. Plant trees and shrubs a minimum of 7 feet from roadways where salt spray may occur from street maintenance. Use deicing salt sparingly to protect Minnesota waters. Minnesota Pollution Control Agency press release, November 28, 2018. Minnesota Stormwater Manual. Minnesota Pollution Control Agency. November 14, 2018. Protecting trees and shrubs in winter. UMN Extension. Minimizing runoff from shoreland property. UMN Extension. Wilson, C., Winter is salting our lakes: Study finds freshwater lakes in North America become less “fresh” due to inputs of road salts. UMN College of Biological Sciences. May 2017. Friell, J., Minimize turf damage from salt this winter, Josh Friell explains … UMN Turfgrass Science. October 30, 2013.